Gillnet fishing - as practiced in inshore and coastal waters in the United States - is a selective, environmentally friendly method of providing highest quality fish to consumers. Unfortunately, the reams of justifiably negative publicity directed towards the indiscriminate use of high-seas drift gillnets several years ago has caused a lot of confusion concerning this type of fishing. Internationally, strict regulations and outright bans on the miles-long drift gillnets have effectively brought under control what was a problem fishery. Gillnets commonly used in New Jersey's fisheries range from several hundred to several thousand feet in length. Their depth may be from ten to forty feet or so. They are "set" to intercept fish during their normal migrations, either along the shore or as they move in and out. Depending on the species sought, gillnets can be fished on the bottom, at the surface or anywwhere in the water column. They can be anchored or allowed to drift with the vessel from which they've been set. The New Jersey gillnet fleet is made up of smaller vessels, generally under 50 feet in length. 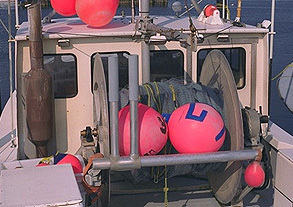 While some gillnetters still set and haul their nets by hand, many now use hydraulic net reels (see the picture above) to aid them in this srduous task. The size of the mesh in a gillnet, along with the fisherman's intimate knowledge of the behavior of the fish he is seeking, guarantees that bycatch of other species will be minimized. Minimum mesh sizes - which are mandated in the management plans for each species sought - ranges from four to twelve inches. Smaller fish generally swim through the mesh. Even when smaller fish or non-targetted species are caught, regular tending of the net by the fishermen ensures that many of them are released alive (in the photograph below a small shark which was entangled in a monofilament shad gillnet is being returned to the ocean alive). This also guarantees that the fish that are retained are in excellent, ocean-fresh condition when they get to market. 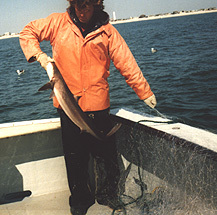 Species sought by gillnetters in New Jersey include bluefish, monkfish, weakfish, dogfish (called greyfish in the United Kingdom and used in "fish and chips") and shad. A small shark being released after having been inadvertently captured by a gillnet (N.Stolpe photo).